With one year to go until the UK leaves the EU, the Society of Motor Manufacturers and Traders (SMMT) today set out its priorities to assure the UK automotive industry’s future success. The move follows agreement of a Brexit transition period, designed to allow business to continue as usual while a new UK-EU trading relationship is negotiated. While the deal provides some welcome breathing space, the industry now seeks rapid progress on key automotive concerns to avoid another cliff edge on 31 December 2020. All of this will be vital if the UK is to remain a global destination for future investment in new technologies, including digital manufacturing, lightweight materials, vehicle electrification and connected and self-driving vehicles. The Government’s Industrial Strategy, published last year, and the accompanying Automotive Sector Deal recognise this, but cross-Government policies must align to deliver on the ambition. A new SMMT study of economic figures highlights the industry’s impact on adjacent sectors. From raw materials and R&D, to logistics, freight and shipping; from retail and distribution, finance, insurance, fuel and maintenance, to telecoms, electronics, IT and tech; and not forgetting motorsport, travel, advertising and media, sciences and education, the list of sectors which depend, at least, in part on the success of the automotive industry is extensive. “Last week’s deal on the transition period was essential, providing a short term boost and a degree of certainty for investors. The next major hurdle will be securing a new, comprehensive trade agreement with the EU and our partners across the world. In the meantime, government must help make the UK as competitive as possible. 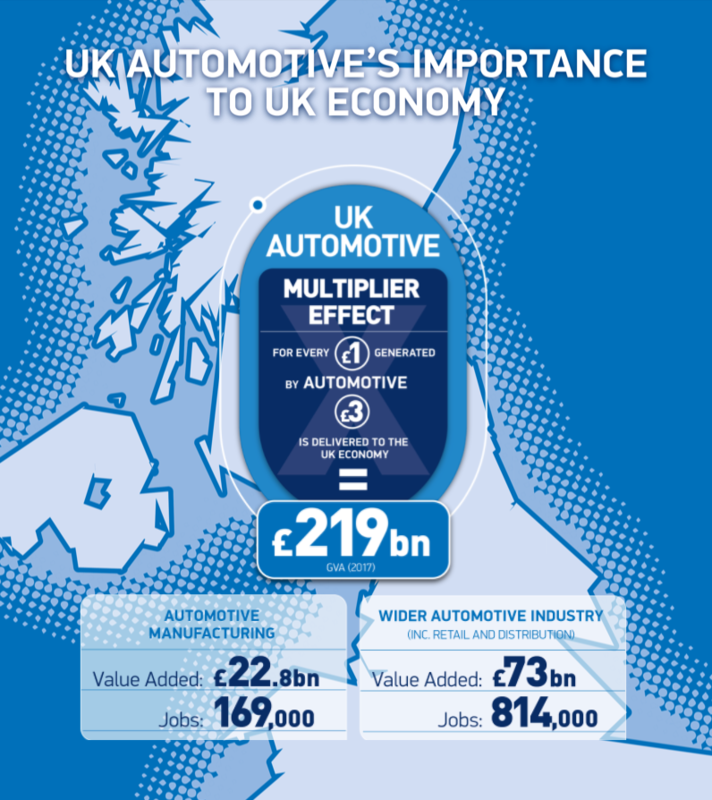 Remaining part of the single market and customs union, continued access to EU talent, and the ability to benefit from preferential EU trade agreements with third countries remain the UK Automotive industry’s priorities in the future EU-UK relationship. Equally important, however, is the need for the UK to maintain influence within EU regulations, both during transition and after Brexit, as critical decisions are taken on shared issues such as CO2 and data – issues which will ultimately affect UK consumers, exporters and other businesses. 2. Calculation based on 2010 OECD ‘automotive’ output multiplier of up to 3 using 2017 projection using UK ONS official sources, estimates and projections to 2017. N.B Multiplier values will vary by country, position in economic cycle, activities within the value chain and between domestic and all traded linkages.